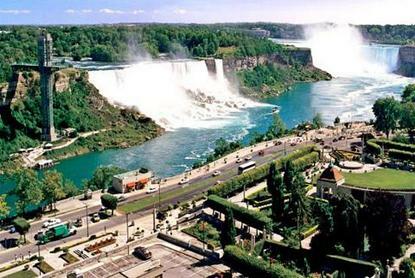 Situated in the heart of the tourist district, the four-diamond award winning Sheraton on the Falls Hotel is just a quick one-minute stroll from the breathtaking Niagara Falls. 670-well appointed guest rooms and spectacular Fallsview bi-level suites with balconies provide beautiful views as well.Our full-service hotel is directly connected to Casino Niagara and features two swimming pools, Fallsview Spa and Fitness Centre, and breathtaking views from the award-winning Penthouse Fallsview Restaurant. Our Sheraton on the Falls Hotel Conference Centre is the largest conference centre in Niagara and can accommodate up to 2,300 people.We are also part of the Falls Avenue 20-acre entertainment complex with direct indoor connections to Marvel Superheroes Adventure City, Rainforest Caf?, Hard Rock Caf? and Club, and MGM Studios Plaza. The Hershey Store, Planet Hollywood, 4D Theatres and other great shopping venues are also onsite.Special ConditionFrom February 5 to February 8, 2007, the indoor swimming pool will be closed for annual maintenance. Guests are are welcome to use the indoor pool at our sister hotel located nearby. Please contact the hotel for further information.